For such a gentle creature, the Florida Manatee actually has a tough life. 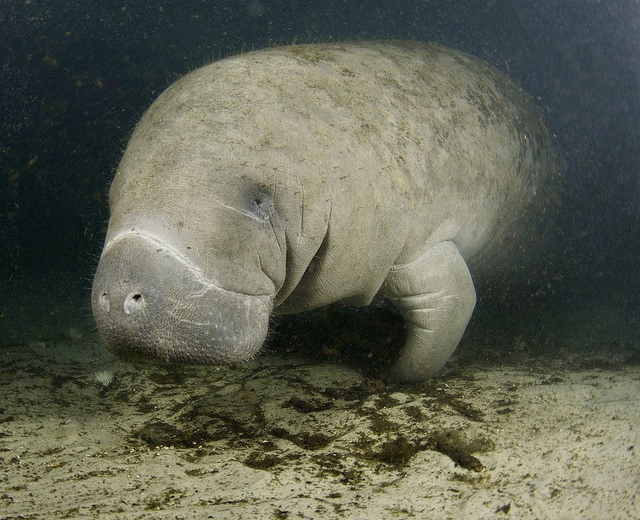 I mean, they just sort of bob and float around and eat grass all day, which is pretty nice, but with Manatee Awareness Month starting in November, it's a good time to look at the number of deadly threats facing this endangered species. When they aren't getting hit by boats, which is their number one cause of death, they suffer from crazy guys jumping on their backs or ladies trying to take them for a joy ride. Unusually cold weather can kill off hundreds, as well, as it did in the winter of 2010. Sadly, 2013 has been the deadliest year on record for manatees, due in part to a toxic red algae bloom, which can poison the manatees and other wildlife, causing paralyses and eventual drowning. In April of this year, 241 manatees had been reported killed due to the algae. Now the number of dead manatees has risen to 769 so far this year, which is a record high. Experts are uncertain why this year’s algae bloom was so lengthy and toxic. Phosphorus runoff from fertilized farms and lawns may have contributed, because algae thrive on a phosphorus diet. Once again, we're reminded of our interconnectedness with other species and the environment. Because of our current system of unsustainable agriculture that is far too dependent on chemical fertilizers, as well as our quest for artificially green lawns, we're contributing to record deaths in already vulnerable species. It can feel strange to think of how our shopping habits or landscaping choices impact manatees, but this is just an example of how the choices we make as individuals and a society create ripple effects that stretch through the economy and the environment. For another look at what the manatees face in their struggle for survival, check out this time lapse video of people upsetting resting manatees. It shows, as Jaymi aptly put, the manatees being "loved to death". Manatees Timelapse from Sea Legacy on Vimeo. November is Manatee Awareness Month in Florida and these gentle beasts are not having a good year. Here's a look at the challenges they face.